small ACS Athens printed logo (owl). (with owl) (across chest). Navy Blue color. logo (with owl) (across chest). Royal Blue color. logo across chest. Oxford (Sport) Gray color. blue ACS Athens logo. Gray color. embroidered yellow ACS Athens logo. Hooded Sweatshirt with large front pocket. Blue navy ACS Athens Logo. Yellow color. logo across chest. Navy Blue Color. logo (with owl) across chest. Hooded Sweatshirt with front large pocket. across chest. Navy Blue color. Yellow Owl / ACS Athens logo. Navy Blue color. printed logo (with owl). Navy Blue color. 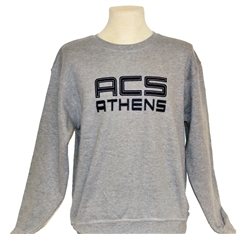 embroidered small ACS Athens logo. Navy FLEECE Jacket with zipper and two side pockets. Small embroidered ACS Athens logo on chest. zipper and hood. Two front large pockets. small navy blue ACS Athens logo.